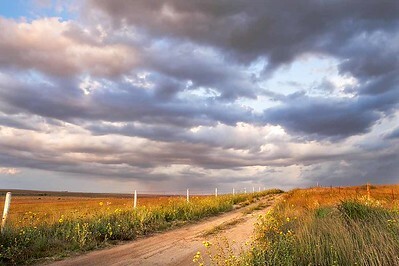 These are Kansas photographs from places without a dedicated gallery. 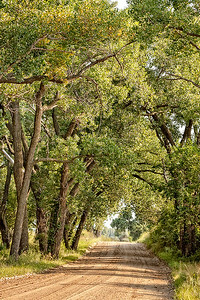 Stately cottonwoods line a sandy section line road near the Quivira National Wildlife Refuge. Northeastern Stafford County, Kansas. August 25, 2015. 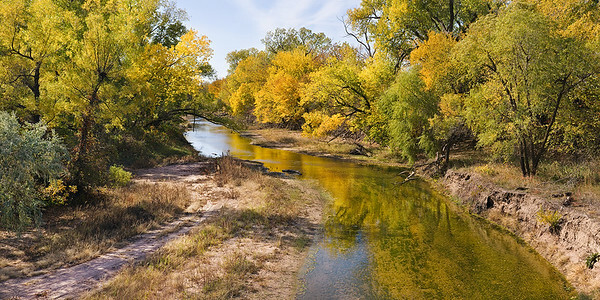 The South Fork of the Ninnescah River begins in eastern Kiowa County and flows east 49 miles, passing Pratt, Cunningham, Kingman, and Cheney to its confluence with the North Fork in western Sedgwick County. East of Cunningham, Kansas, in Kingman County. July 17, 2013. 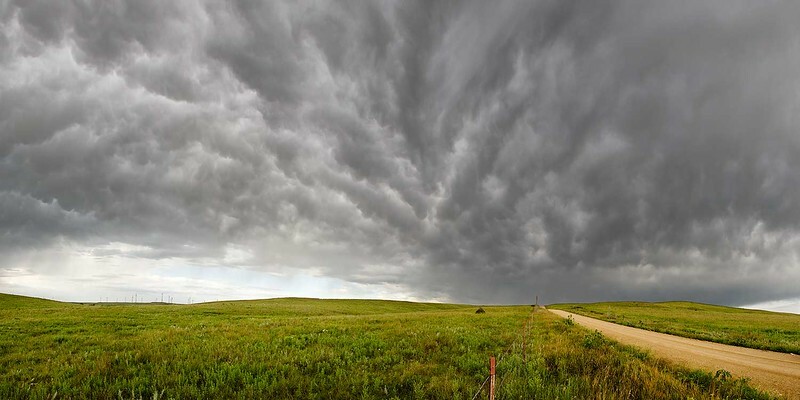 The wheat harvest on the Great Plains is often a race with the weather. 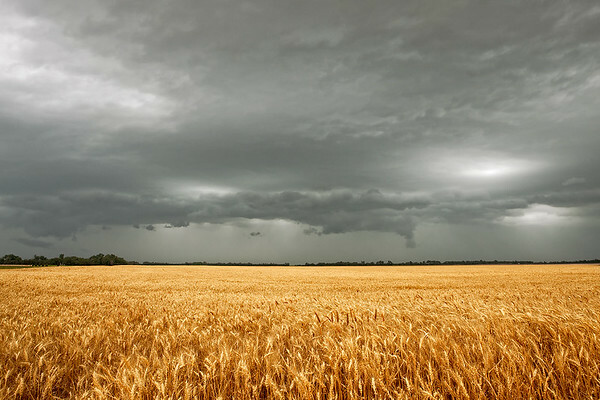 One unfortunately timed storm can delay harvest and allow weeds to take over, or can completely flatten a field of standing grain. Western Stafford County, Kansas May 30, 2012. 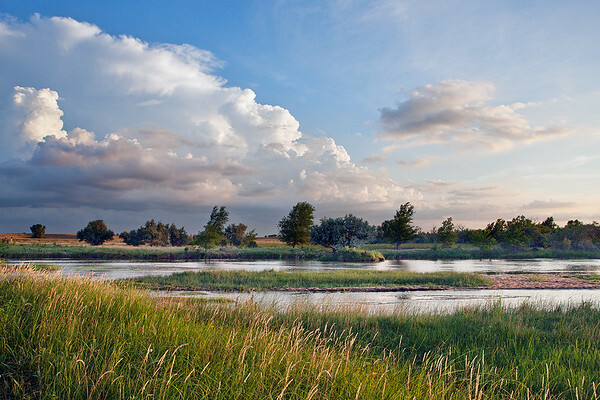 The Arkansas River flows through the southwest portion of Rice County, Kansas, past the towns of Raymond, Alden, and Sterling. This autumn view is just south of Raymond, Kansas. October 24, 2011. 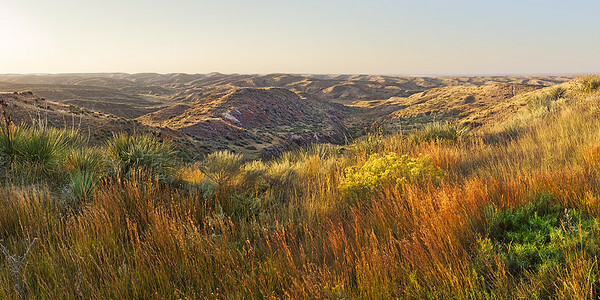 The Arikaree Breaks are a rugged landscape of canyons in far northwest Kansas. They are covered by short-grass prairie and grasses like the red-gold Little Bluestem seen in the photo. North of St Francis, Cheyenne County, Kansas. September 27, 2009. This scene is 2 or 3 miles east of Kiowa, Kansas, in Barber County. 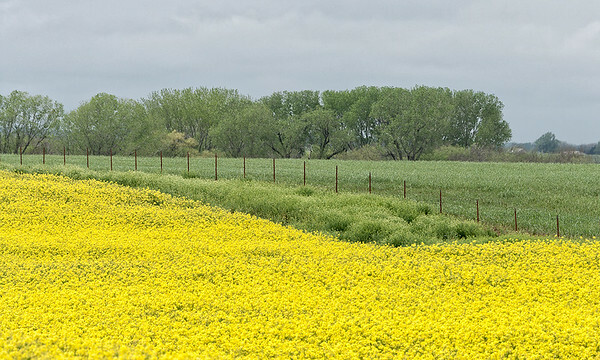 I don't know whose crop this is, but I liked the soft mix of yellow, dusty green, and blue-gray. Southeast Barber County, Kansas. April 30, 2009. 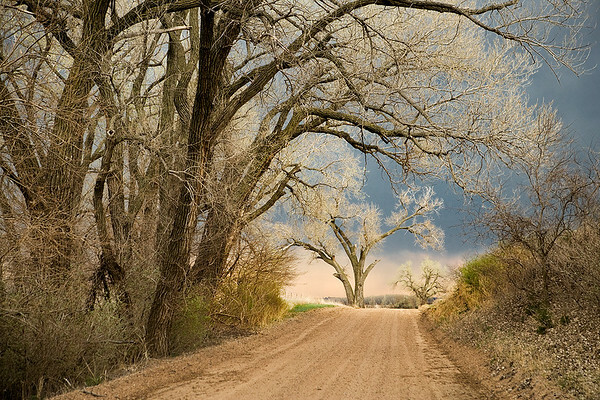 These roadside cottonwoods are budding as a late afternoon thunderstorm approaches, bringing both rain and intriguing light. Northeast Stafford County, Kansas. April 22, 2009. I was in the area to photograph the wind generator farm that lies along I-70 in Lincoln County. While a few generators are visible in this image, the cloud patterns, the road, and the fence were what interested me. Eastern Lincoln County, Kansas. August 13, 2008. 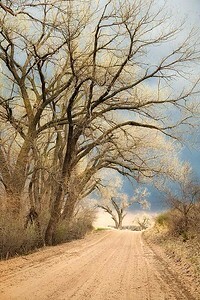 For years, a quarter-mile stretch of this western Reno County road was canopied by elms and cottonwoods. I've had adults tell me that, as children, they pestered their parents into driving this route so they could see the trees. Sadly, the trees have suffered wind and ice damage and have been severely trimmed so that the canopy is gone. West of Hutchinson in Reno County, Kansas. October 24, 2006. I was at the spot late in the day to photograph 'The Mighty Samson of the Cimarron,' a railroad bridge 1,268 feet long erected in 1939. 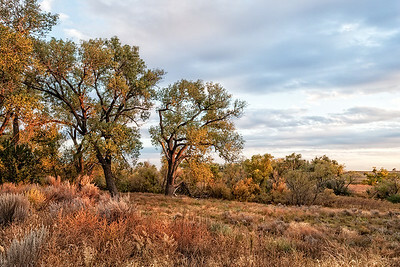 The sun dropped below low clouds in the west and spotlighted the cottonwoods and the dry plants in the foreground. Between Liberal and Kismet, Kansas, (Seward County) where US 54 crosses the Cimarron River. October 23, 2006. Peace Creek is an intermittent stream that flows through Stafford and Reno counties. It joins the Arkansas River southwest of Sterling in southern Rice County. Western Reno County, Kansas. September 23, 2006. 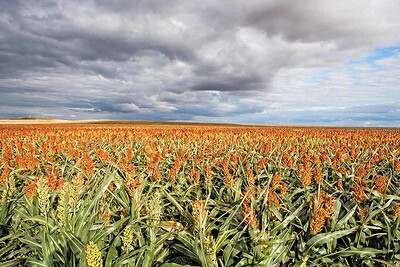 Grain sorghum is economically important in areas where low and erratic rainfall and high temperature limit the production of other summer crops. The United States is the largest producer of sorghum with 6 million acres of grain production in 2005. Western Reno County, Kansas September 23, 2006. With about an hour of daylight left, I drove south from Ulysses, hoping for some good light on the clearing rainstorm. 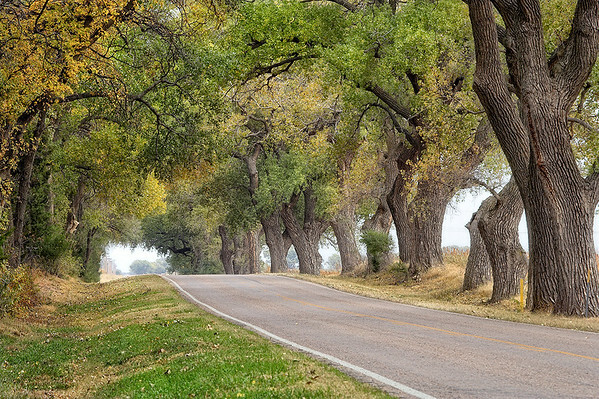 This sunflower-lined farm road is just south of the Cimarron River. Grant County, Kansas. September 9, 2006. 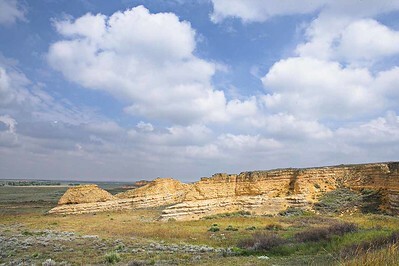 Niobrara Chalk bluffs along the Smoky Hill River valley. West of Russell Springs, Logan County, Kansas. September 9, 2006.